This concept was inspired by the re-coloured Rockies logo that combined red, green and black. I wanted to see if I could combine the three colours in a set maintains the classy vibe of the current uniforms. C & C welcome and appreciated, thanks for looking! 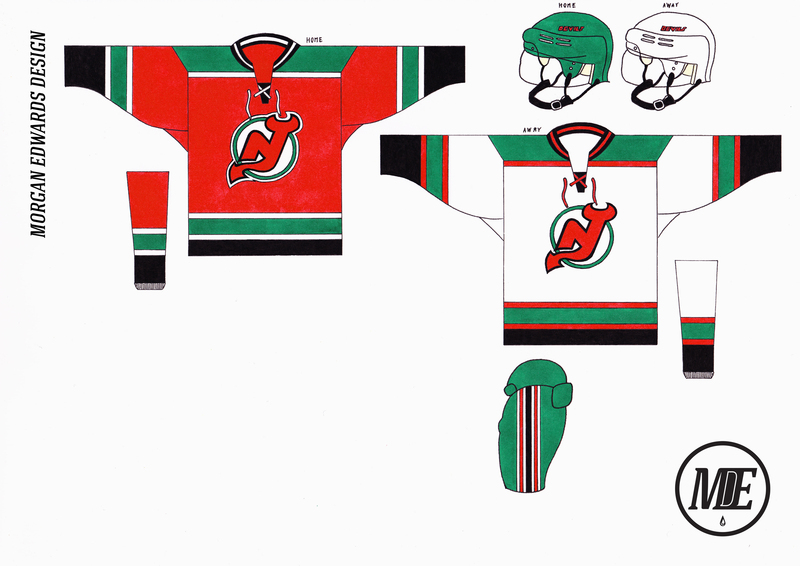 I... want to like the Devils set, but I'm sorry. Green & Black with Red don't work unless Black or Green is the dominant colour usually. The Away sweater looks great & has a great balance of the 3 colours, but the Home is a mess. If it was a Black or even a Green jersey, the colour balance might be better. One more thing: The pants don't work. The black stripe looks out of place of them & it looks like you ran out green, so you decided to fill it in with black cause "Why Not?". I will admit I love the socks though. Devils striping is great, but like Kitt said, the three colors don't mesh as well as two of the three would. Personally, I think the home looks better than the road, I think the road looks a little muddled, but I would go with just red and black/green. I've loved the series so far though! 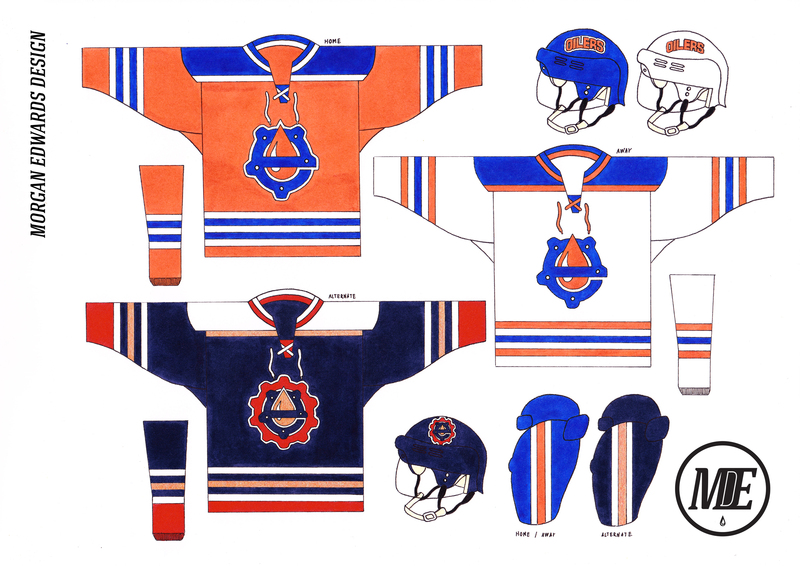 The goal for this concept was to pay homage to the dynasty years with orange serving as the dominant colour. I coloured the inside stripes of the orange uniform 'Royal' to make the colours contrast and gave both uniforms a blue yoke to balance things with the pants. I gave the team a new primary logo that combines a lower case E, a gear and an oil-drop. The alternate takes the aesthetic of their 90's look but makes red slightly more prominent. All instances of copper are now metallic to avoid the awful brown colour. C & C welcome and appreciated, thanks for looking! Oliers are great. The logo you've created would make a great primary or even secondary mark for the team. Based the main set off their 2017 Winter Classic jersey but gave the logo the update it desperately needed. The alternate is based off their yellow and navy look with a stand-alone bluenote replacing the roundel. C & C welcome and appreciated, thanks for looking! 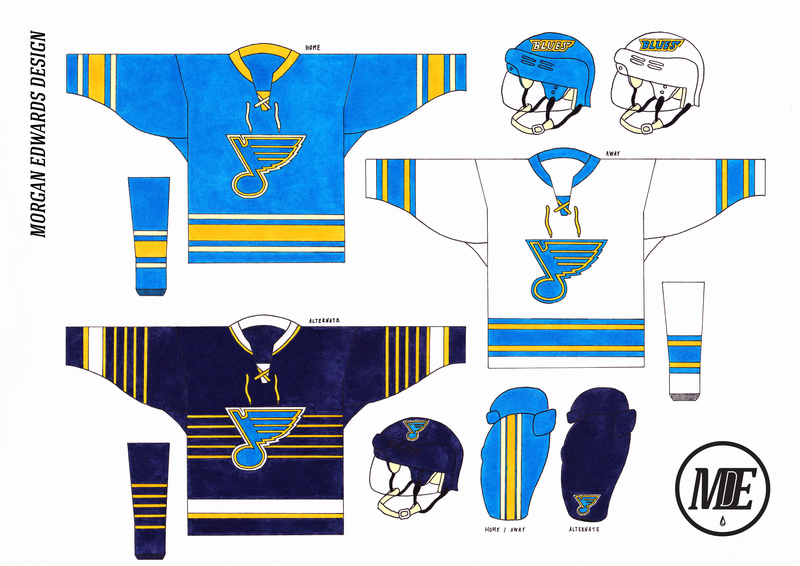 I like the alternate for the blues, but the sleeves look like they have too much going on with the six stripes right up next to the yellow and white stripes. Maybe move those down so there's some separation between the six stripes? The home and away are beautiful. Just curious, how long does it take to make a concept like this? Now seems like a good time to reveal the process behind these concepts. Tracing is your best friend when doing a hand drawn concept because it saves time and guarantee's consistency. Every concept starts out as a single, black and white line drawing which is traced twice for the main set. Alternates also start out as template either on the same sheet of paper or a different one. Doing the line art for the actual concept can take anywhere from half an hour to an hour. Creating templates gets easier the more concepts you do because you can recycle elements from them. It's the logos that eat up most of the time. It's the colouring that takes the longest because you have to be super careful that markers don't bleed through the lines. This is very hard to do in one sitting and usually takes at least an hour. Shortest time I spent on a concept was an hour and half. Longest was 3 plus. I wish that I could use markers, but I simply don't have the amount of variety of them. When I do concepts, I use colored pencils, which doesn't look as good but I have tons and tons of them to choose from. However, the true problem is when you run out of a color (the pencil gets too short to use). I recently had to halt a in-progress MLS series I was working on because my black colored pencil ran out, and I had to order new ones and that takes a while. That's also why I stopped my original NFL series (that's another one that I was planning on doing after the MLS). It must take much more time than what I do, and I need a good 2/2.5 hours to complete a home, away, and third, with much less detail than yours. Also, the new Oilers logo is incredible. Montreal is a team I hate to do because their look is so iron-clad. 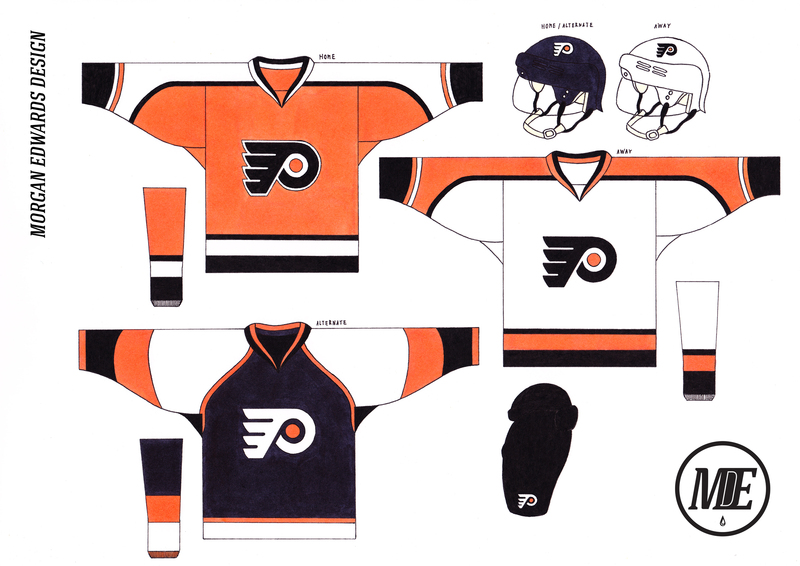 Any deviation from their 3 classic jerseys feels like heresy which unfortunately doesn't leave room for much creativity. 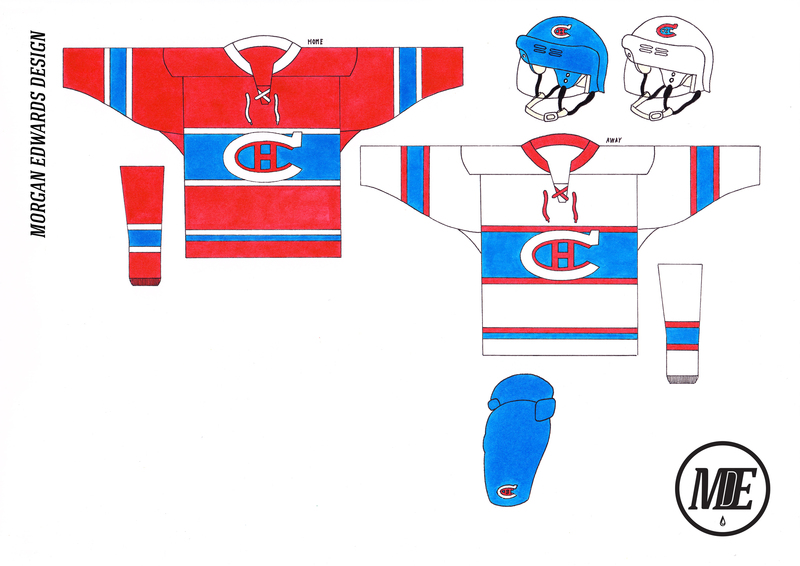 This set is based off their recent Winter Classic uniform. I thought the lighter shade of blue was really sharp. C & C optional for this one . Thanks for looking and I promise the rest of this series will be more creative. I've saved what I think are the best concepts for the final stretch, starting tomorrow. Unpopular opinion time: I really like the Kings home-plate logo. My only issues are the use of the overly complicated crown and that they didn't make a white version for the home blacks. A primarily black logo on a primarily black jersey just doesn't work so I created a white version and simplified the crown. Both uniforms feature hem stripes now and the the 'LA' patch has been added to the shoulders. The alternate tips the hat to the Gretzky years without being a straight-up throwback. I thought the league needed a silver jersey and I added large areas of black to make ensure it stands out against roads. C & C appreciated, thanks for looking! Wow. 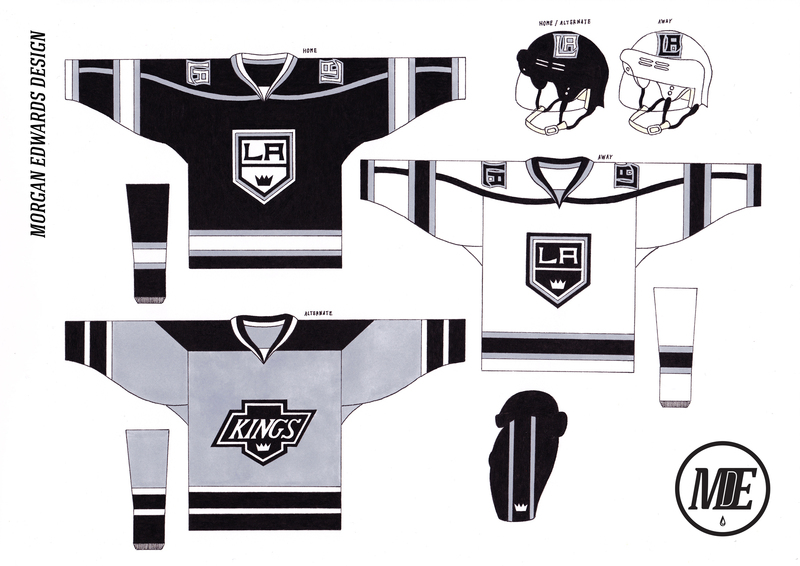 These look amazing, but why is there no LA on the shoulders, it was on the home and away. That's my only nitpick, this is a great set. Great Job. Thanks! I left the shoulder patches off the alternate because the fonts don't match. Okay, it's time for a wildly unpopular opinion. 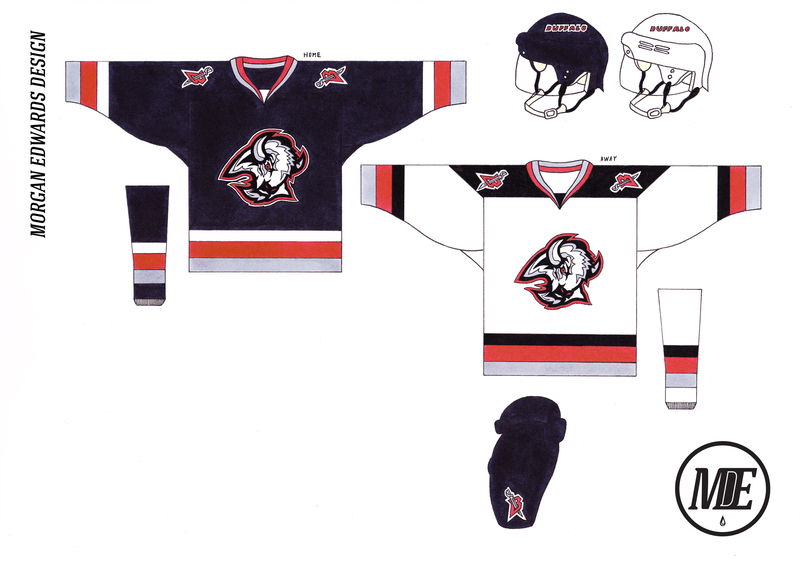 I hate the Sabres so called "classic" look. I hate the static, poorly rendered logo with the two crossed sabres, I hate the tranquil blue and gold colour scheme, I hate the mismatched striping on the road jersey and I hate the update with navy and silver. What I do like is the set they wore from 1996 to 2006. The so called "goat head" is a beautifully rendered Buffalo that looks remarkable as an embroidered crest. The striping was wholly original and the colour scheme was perfectly suited to a sword based team. For this concept I took the spectral essence of that set and simplified it a bit. I straightened the shoulder yoke on the road, dropped one of the shades of silver from the logo and made the striping a little more traditional. 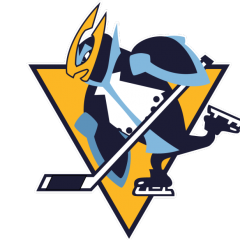 No the primary logo doesn't feature a "sabre" but honestly, why is that such a big deal anyways? People are advocating left and right that the Senators go with a generic "O" so this group think really seems like more of a rejection of complex logos. C & C welcome and appreciated, thank you for looking . 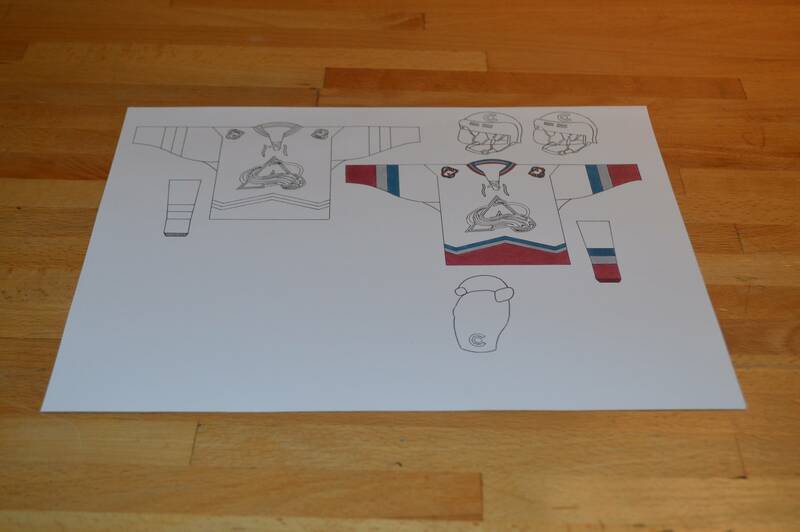 I actually really like this Sabres concept. It's different, but that's what makes it stand out IMO. It also use the best shoulder patch the team has ever had, so that's a win in my books. The Flyers have only really had two (long-term) looks in their history so I sought to combine the best elements from them into a cohesive set. 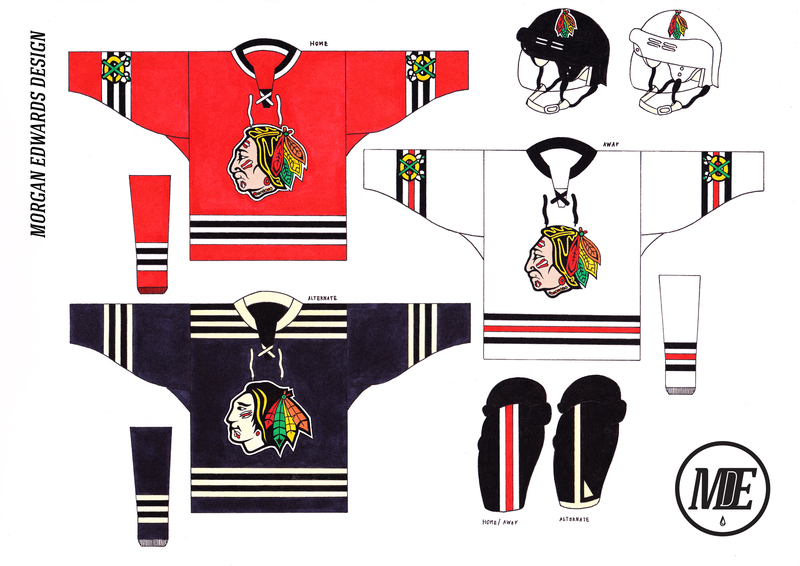 The alternate is based off their short lived edge jerseys with some important fixes. The sleeve stripes have been fixed so they don't look so wonky from the side and hem stripes were added to make things less top-heavy. C & C appreciated as always, thanks for looking! Another hard team to do since their current look is so perfect. 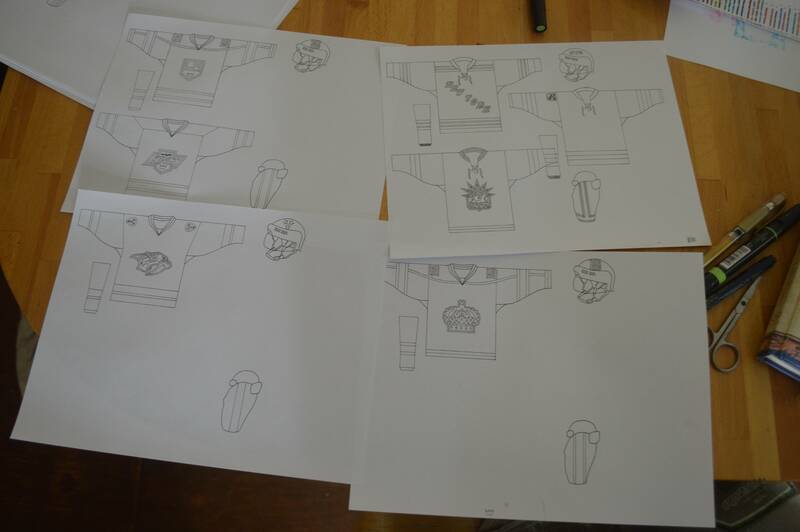 I based the main set off their recent Winter Classic jersey and adopted its retro crest full time. Its chain-stitched glory just looks better than the current mark to my eyes. The alternate is based off their original black and white look with a full-colour crest to make the updated logo stand out. I also thought it'd be cool if the helmets simply used the feathers from the primary logo instead of just duplicating the indian-head. C & C appreciated, thanks for looking! I really like the younger BlackHawk on the alt uni. Used the Stanley Cup winning set as a base and made the sleeve and hem stripes consistent. 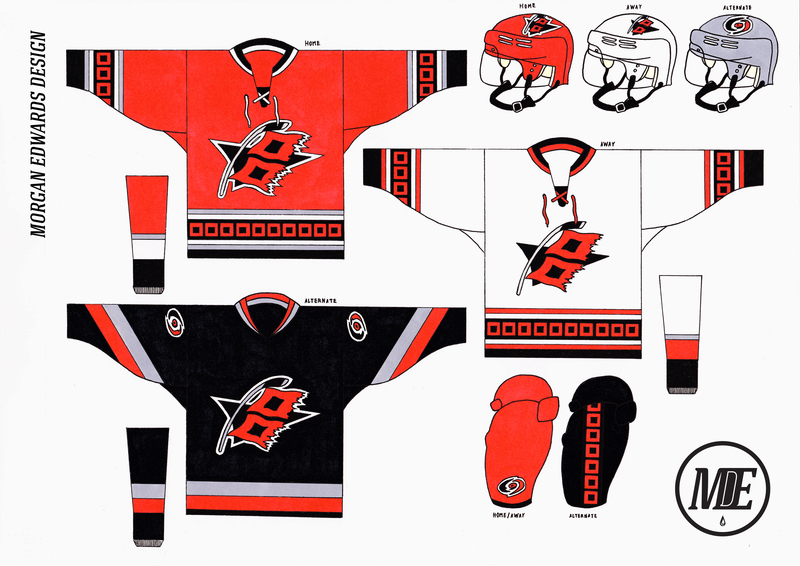 The primary logo is an updated take on their original shoulder patch that now depicts an actual hurricane warning. Since the striping is on the busy side, I decided against shoulder patches though the swirling logo appears on the pants. The alternate is based off their current black uniform and I decided to drop the 'filmstrip' striping and colour the shoulder patches. Also gave it a grey helmet to be different. C & C appreciated, thanks for looking!